I’ve not had many opportunities to sketchnote in the past few months, but I keep the practice up by trying different style, different fonts, different ‘thinking’ and concepts. But what i love is seeing what other people do and seeing if I can adapt and include in my own ‘repertoire’. So, where can you find ideas … try Google Image search! A quick and easy search (and very basic) using terms like ‘people sketchnote‘ or ‘font skecthnote‘ or ‘sketchnote writing‘ or ‘sketchnote faces‘ and you’ll get some wonderful results. 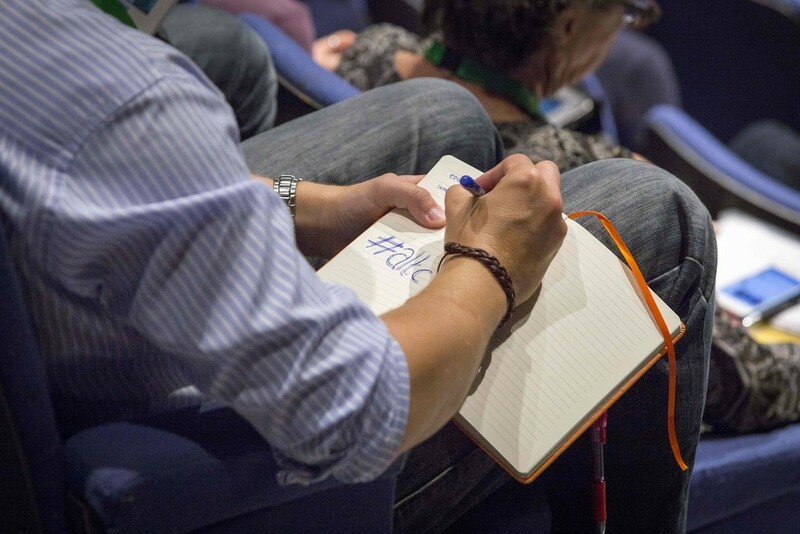 So, with only two weeks to go before this years ALT conference (ALTC) it’s time to start making sense of the programme and sessions, see what’s happening and when, and then trying to work out how to be in several places at once. 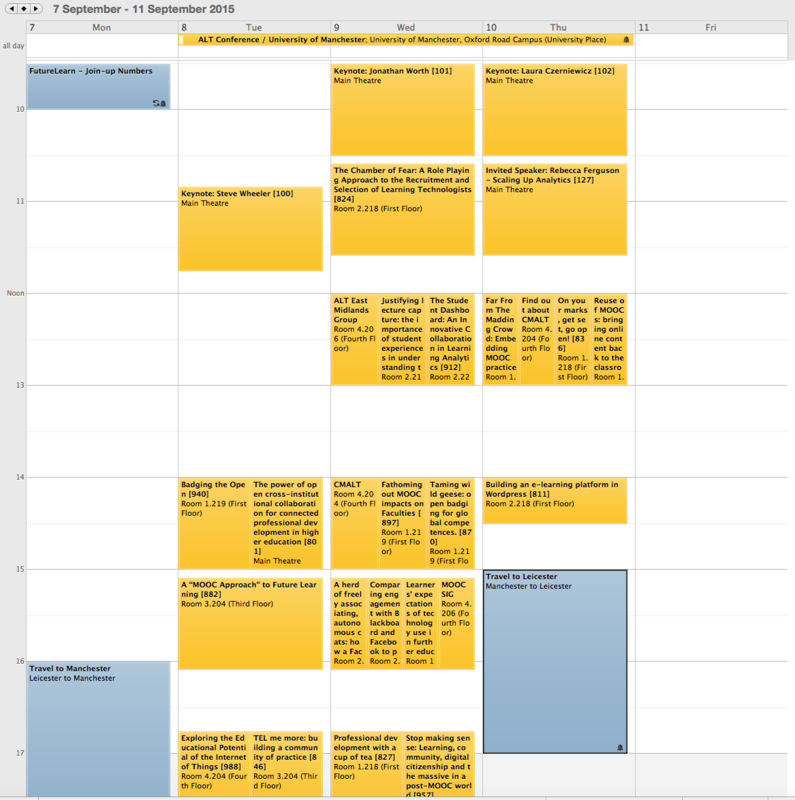 So, after a first pass at the ALTC programme here are my plans, subject to change once I spend more time reading more of the abstracts and changing my mind. I think I may need to compare notes with someone who can get to some of the sessions I miss? Other ways I’m getting ready and gearing up for ALTC is making sure I have the necessary ‘stuff’ around me, and working, now so I won’t be rushing on the days before hand. Perhaps the most important is to have enough power with me for phone and tablet, for this I’ll be taking a wall charger as well as an Anker Astro Mini battery. As always I’ll really enjoy the sessions as well as catching up with old friends, and making new ones .. and meeting ‘virtual’ friends for the first time. So please come and say hello, either in the sessions or in the down-time between (and at the evening events!)! Big question .. how many sketchnotes can I get this year? Comments? 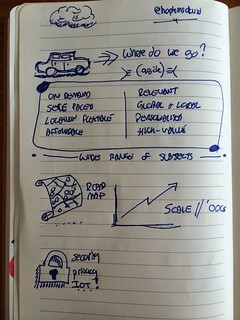 Note taking has taken on a whole new meaning for me since I started making Sketchnotes. 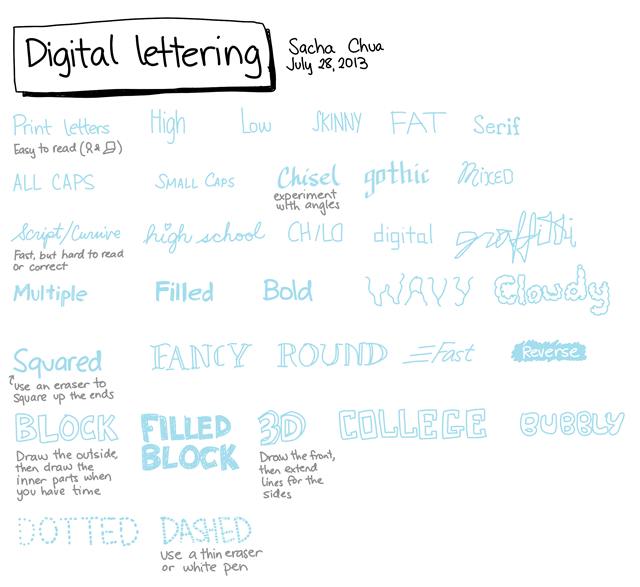 For the uninitiated sketchnotes are all about. 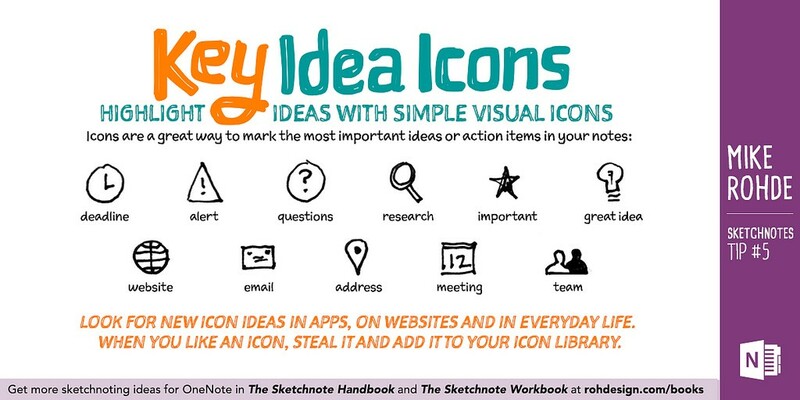 If you haven’t already, I recommend you check out Mike Rohde’s Sketchnote Handbook. If, like me, you want to sketch your notes at a conference or event, and worry about missing important details or not being ready, here’s a cheat-sheet for you. Pens: Get your pens (including back-up pens if you think you’ll run out of ink) ready and somewhere you can easily get at them. Also worth keeping an eye on is where you can store them for easy access whilst you’re sketching – pocket, bag, table, etc. There’s nothing worse than dropping your pens, book, phone, etc. when you’re trying to pay attention. Try and use at least two colours, and be consistent in how you use them (shading, highlighting, etc.) across all your sketches. 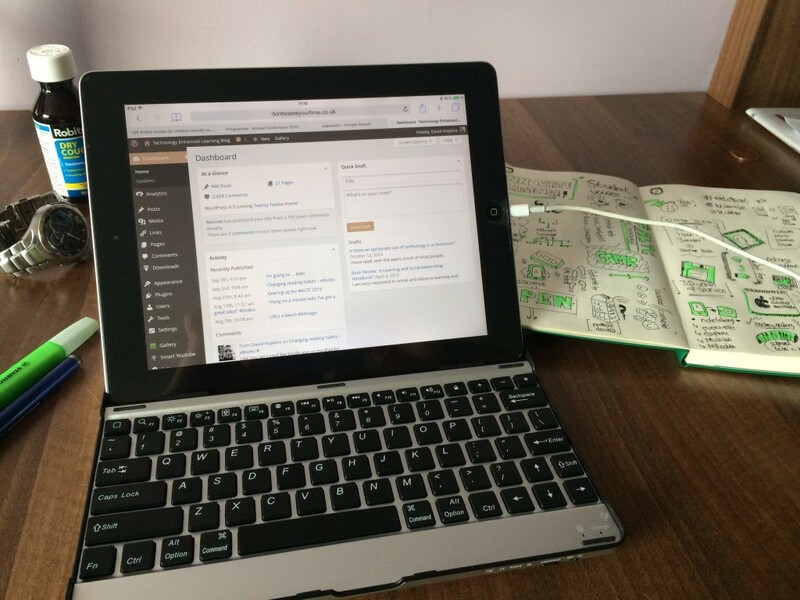 Page-per-note: Prepare each page of your notebook with the details of the speaker and/or presentation. Include name, Twitter name, presentation title, etc. in your own design. This way you know what space you’re working with for the presentation, and who it is for. Be careful to make sure you check if titles change! Speed: If you think the presenter will go too quickly use a different notebook or page for rushed concepts and re-draw them later when you’ve got time. This is good practice and revision on whether you got the details of the talk you wanted to. Upload/publish: If you publish your sketches to somewhere like Flickr then create your album before the event. This will make it easier to upload each sketch when you’re ready, and get a useable short URL from it when it’s published – e.g. https://flic.kr/p/neuoBj. It’s also worth mentioning here to make a note of what tags you’re going to use (and location) for each sketch. 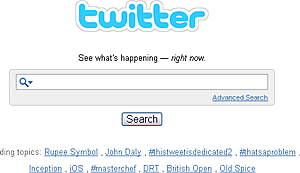 Pre-tweet: Prepare a tweet with the correct hashtag and presenter name, and any other text you want to tweet. Leave space for the characters needed for the link to the photo. Practice: Before the event, or when you have time, practice drawing basic shapes, faces, arrows, objects, stylised font and writing, icons, etc. If you use something like Paper 53 or other digital sketching Apps on phones or tablets to sketch you can still prepare for the sketching and how/where you’ll publish them. 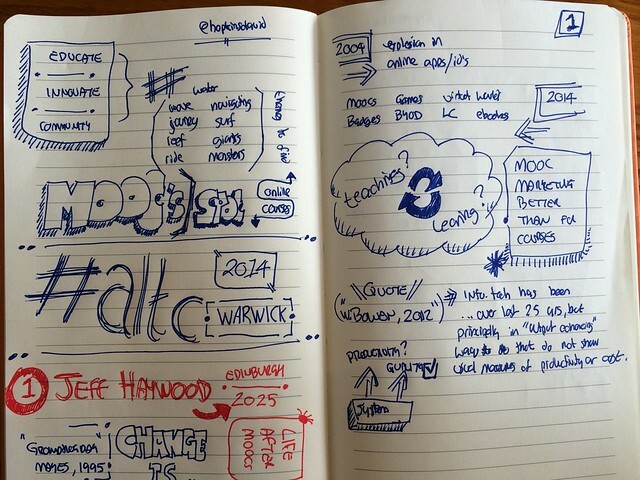 Time: Don’t try and sketchnote every talk, be selective about who and what you make notes of. I tend to sketch the keynotes or features speakers, and one or two key presentations that I want to keep a (detailed) record of, and generally make smaller, lighter notes of other talks and nuggets of information from other presenters. it also makes it easy to keep up with everything that’s going on. Post-event: It’s now that I usually photo each sketch (maybe after a little more sketching to improve or fill in the gaps) and upload to Flickr (here are my ALTC sketches, and ones for BbTLC14). Try different locations and lighting for the photo, try to eliminate shadows and unnecessary borders in the photo around the page (not an issue if you sketch digitally). 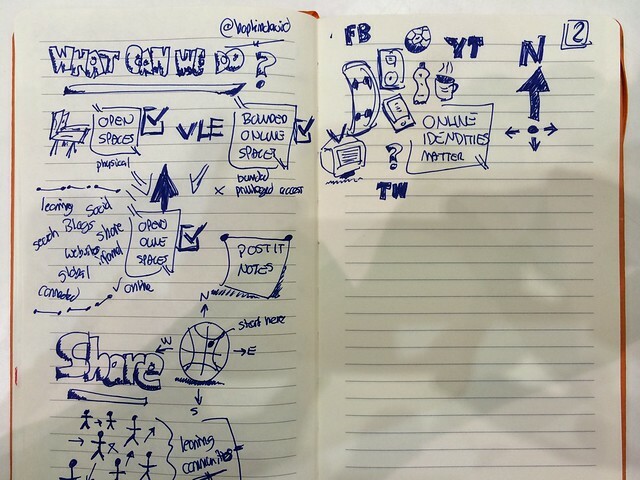 Many of my friends now use sketchnotes (yes you, Sheila! Well done) or some form of note-taking at events now, and there are a whole multitude of different styles and approaches, all of them valid and wonderful. There is no right or wrong way to sketchnote, but a little preparation can help with doing it smoothly and without stress or worry about missing something. PS. I can’t draw. I know I can’t, and it bugs me. My straight lines are not straight and my cats or dogs look like alien invaders worthy of being squashed in the most hideous ways imaginable. But that’s not the point: I like it, and I remember more of the meeting, event, or presentation than I used to. 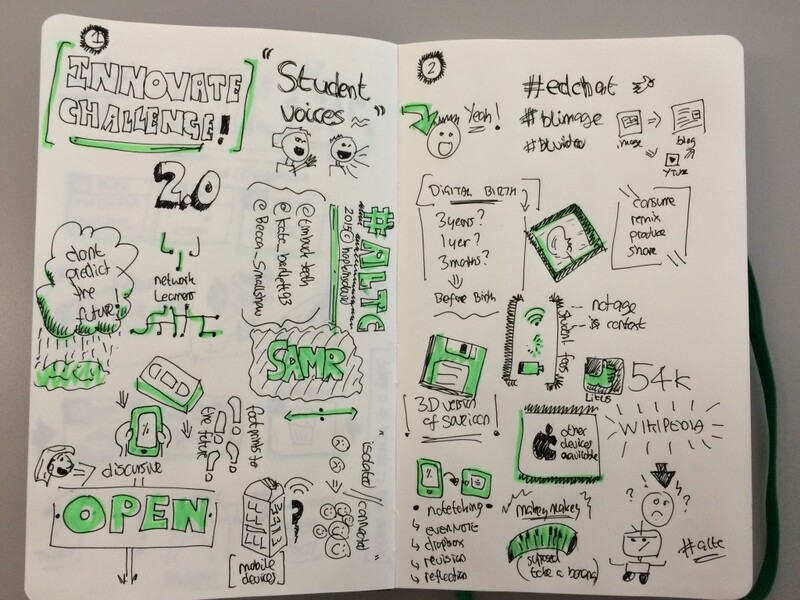 This is why I sketchnote! What about you? Post-Sketch the second talk. Again, try listening to the key points and concepts and sketch as much as you can. Try using some of the tips mentioned above during the live sketch. This time you’re allowed to go back and polish up the sketch. However, pretend you’re at a large conference and you may not have a lot of time. Keep the post-sketch time at a reasonable limit such as 10-15 minutes for each sketch. You know I like sketching and sketchnotes, yes? If you do too, whether you realise the full benefit of doodling for pleasure instead of doodling out of boredom, then you’ll love this TED talk from Sunni Brown – Doodlers, unite! As usual, here are some choice extracts from the talk, ones I like. 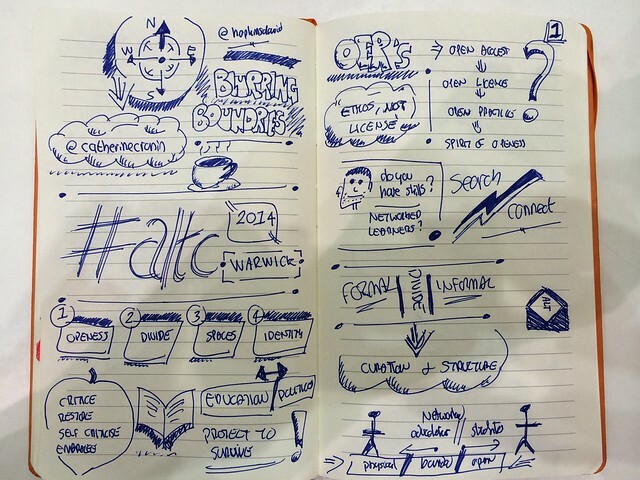 ‘Riding Giants: How to innovate and educate ahead of the wave’ is the title & theme for the 2014 ALT Conference – my first ALT conference – and my second post, this one about the second day. 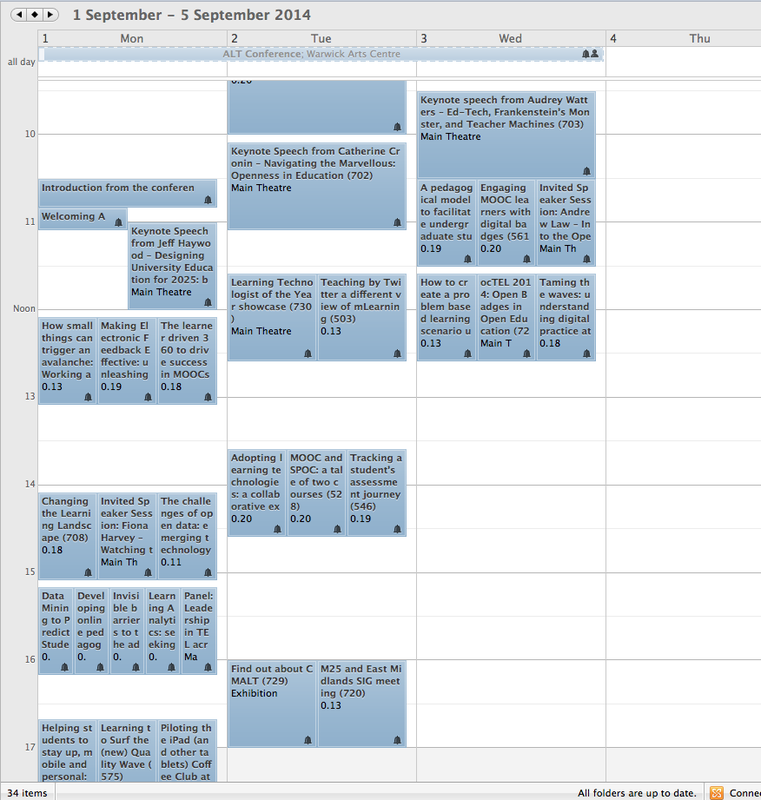 Well, when I say second day the first day never really stopped – one downside of being connected and part of a massive PLN is that the tweets, emails, DMs, mentions, etc. don’t stop. At one point at the end of day 1 I had to just say enough, put the tablet & phone down (to charge) and then go charge my own batteries. For those who were staying on site and continued the party & chats, you are clearly younger than me! From Catherine to the different sessions, and the East Midlands LT Group, the day was enjoyable, a little too much talk around MOOCs (from people who said they wouldn’t talk about them), lots of engagement and intense brainstorming around so many varied and interesting topics (yes, including MOOCs), and ultimately so rewarding. There is clearly interesting and productive work going on around the UK, and there are so many people,passionate about it, but we all feel the same sense of despair at the bloated talk of MOOC success, inappropriate use of analytics to prove learning has taken place, or the apparent reluctance on academic buy-in on change. In our own way we are all changing these things just by either coming here or engaging with each other online, but it is those who are not engaging, those who have the ability to shape our directions, that we need to get to? I can now be open about my inclusion as part of the Learning Technologist of the Year award, of which I made a short showcase presentation in support of the award itself. The award itself was made late in the day, much to my own embarrassment … I don’t like being the centre of attention, despite writing posts like this and seeing them retweeted and commented on around the world. ‘Riding Giants: How to innovate and educate ahead of the wave’ is the title & theme for the 2014 ALT Conference – my first ALT conference. With the conference themes being weaved thoughout the three days (education, innovate, communicate) the opportunities are here for all delegates to take what they need, give back (through questions, discussions, informal tweet ups, etc), and enhance not only their own ideas and practices but those around them. I don’t want to say I’m surprised by the level of engagement, as that implies I might think that we (learning technology-type people) have such a low level of engagement or closed-door mentality at these events (which we don’t), but I am enthused and proud when I look around the room at the discussions and engagements that are taking place. From lunchtime to coffee breaks, to break-out activities to keynote speakers, this first day has been energetic and had a buzz around ‘being together’ I’ve not experienced since my first FOTE conference in 2009. There is clear symmetry in what we are all feeling as part of the Learning Technology fraternity these days; from MOOCs to student engagement, academic buy-in, digital literacy, experiences, virtual vs. real worlds, etc. as there are so many overlaps between session presentations. Jeff held our attention well, making us all too aware of the different spaces we find ourselves occupying, as we journeyed with him through his and Edinburgh’s 2004-2025 transformation (it wasn’t always easy to see where his vision and Edinburgh’s vision differed, if indeed they do). So many nodding heads as academic apathy is mentioned, so many nervous laughs as we all realise how right he is when dealing with the speed (or lack thereof) of change. Is there life after MOOCs? Is it teaching or is it learning? Are ‘systems’ here to help us increase quality or productivity? One thing Jeff said that made many people gasp with that sudden realisation of ‘oh, yes, we do that!’ was a simple observation about the level of marketing those of us involved in MOOCs make compared to the marketing we do for the paid-for courses we run. Indeed, the level of involvement between the two are unjustly balanced in favour of the MOOCs (despite Jeff saying he wouldn’t talk, much, about MOOCs). Many of us present already have a good understanding of the issues or answers to Jeff’s questions; the pity is that this is why we’re here at ALTC, because we are the ones questioning the ‘system’. Perhaps we need to take ALTC on the road or get more students involved, use the student voice to try and wake the ‘sleepy’ academic minds? Does anyone have a mechanism at their own institution where they are able to disseminate their ALTC experiences to their colleagues? 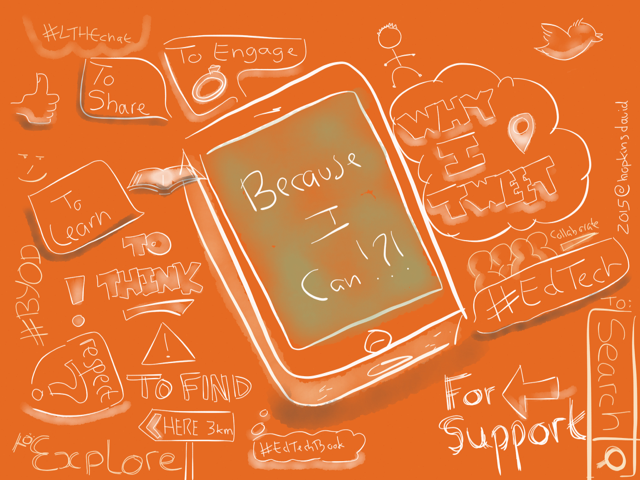 If so please share below: link to your blog, description of your TEL set-up, etc. I learned a new phrase today, in relation to reluctant or ‘sleepy’ academics … CAVES – Colleagues Against Virtually Everything. The backchannel on Twitter was alive and kicking again, as I hoped it would be. It is certainly a good way to keep up with the sessions, especially the ones you can’t get to in the different streams, but it’s also a great social element to the conference, with many of us engaged in the difficulties of what to wear and what transpired as #shirtgate. 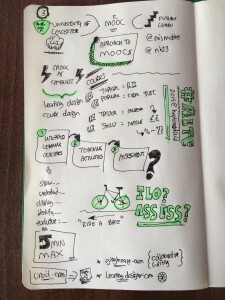 You can see all my ALTC sketchnotes on Flickr as I upload them on a daily basis (eventually) and blog about my ALTC journey ‘riding giants’. See you again tomorrow for part two. The 2014 ALT Conference is just around the corner (in more than just time – it’s being held at the University of Warwick, which is where I now work! ), and I’m getting ready for it. The theme for this year (and my first ALTC) is ‘Riding Giants: How to innovate and educate ahead of the wave’ , and the wave I’m trying to crest at the moment is planning the sessions and presentations I want to attend. It’s not helped by the fact so many of them are interesting, and that so many of them occur at the same time as each other. I’m sure I’ve missed a couple of excellent sessions that I know I want to attend, but I’ve tried to balance it out across the whole three day event. The rest of my ‘getting ready’ preparation is to check I’ve got new gel pens for my sketchnoting, spare cables for various devices, and the all important out-of-office notification set up. Oh, and a map. I may work at Warwick but that doesn’t mean I know my way around yet. Next week will be good, not only my first ALT conference but also a chance to meet and catch-up with so many real and virtual friends. 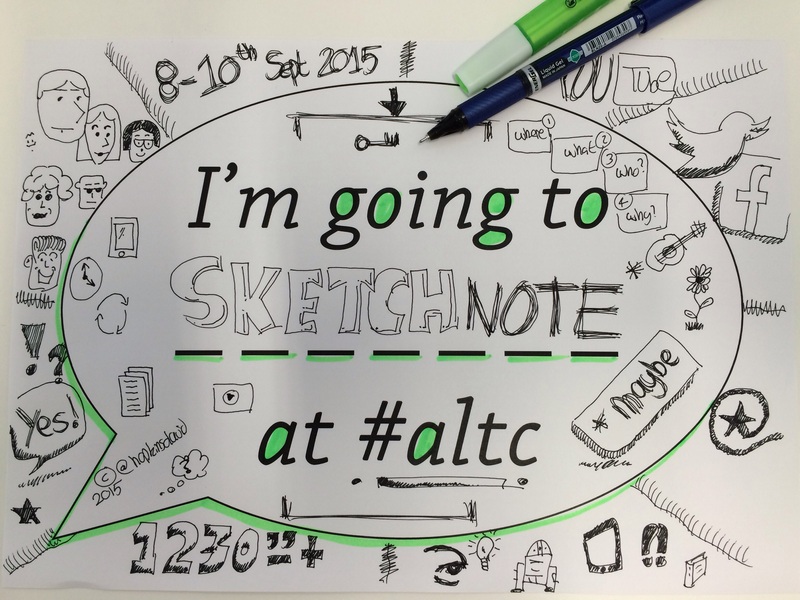 I’ve set my ALTC profile up so please get in touch, let me know if you’re going, and see if we can meet up.